Central Queensland University (alternatively known as CQUniversity) is an Australian dual sector university based in Queensland. Its main campus is in Norman Gardens in Rockhampton. However, it also has campuses in Rockhampton City, Bundaberg (Branyan), Emerald, Melbourne, Sydney, Adelaide (Wayville), Gladstone (South Gladstone and Callemondah), Mackay (central business district and Ooralea), Noosa, and Townsville, as well as delivery sites in Cairns, Cannonvale, Charters Towers, Yeppoon, Biloela, as well as Geraldton, Karratha and Perth in Western Australia. Its metropolitan campuses are in Melbourne, Sydney, Adelaide and Brisbane. As of 2012[update], the metropolitan campuses hosted both international and domestic students. CQUniversity began as the Queensland Institute of Technology (Capricornia) in 1967, and after two years under the name of the University College of Central Queensland, in 1992 became an official university named the University of Central Queensland. In 1994, it adopted the name Central Queensland University. In 2008, it became CQUniversity in recognition of the institutions' expansion beyond the Central Queensland region. CQUniversity's antecedent institution, the Queensland Institute of Technology (Capricornia), was established in Rockhampton in 1967 as a regional branch of the Queensland Institute of Technology (Brisbane). However, the first steps to establish a university in Rockhampton were taken as early as the 1940s. In 1941, the Queensland Labor Premier, William Forgan Smith, introduced section 17 of the National Education Co-ordination and University of Queensland Amendment Act, which provided for the creation of university colleges outside Brisbane. In 1944 and 1945, a series of Rockhampton delegations lobbied the Queensland government for a university college, but after the University of Queensland established a network of provincial study centres in the late 1940s the issue became dormant. Rockhampton's university campaign resumed in the 1950s as Central Queensland became an emerging heavy industry base, with developing coal mines and Gladstone emerging as a light metals centre. In the Queensland parliament in November 1956, the local member for Rockhampton (H R Gardner) stated “more adequate facilities for technical education” were required for the region and, appealing to the philosophy of a “fair go”, he urged that Rockhampton people be given “the same opportunities as those in Brisbane”. In 1958, P J Goldston, an engineer (later, Commissioner for Railways,) mooted the possibility of a Central Queensland university with Rockhampton engineers and after further community discussion, the Rockhampton Mayor, Alderman R B J Pilbeam, called the first public meeting on 3 March 1959 at which the Central Queensland University Development Association (UDA) was constituted. The UDA presented university proposals to government and, in 1961, the Queensland government reserved 161 hectares (400 acres) of government land at Parkhurst (North Rockhampton) on the Bruce Highway near the Yeppoon turnoff as a tertiary education site. Establishment finally was resolved in March 1965, when the Commonwealth government's Martin Report (on expansion of tertiary education) was tabled in parliament by Prime Minister Menzies―who announced the foundation of a new style of tertiary institution at both Rockhampton and Toowoomba. The new institutes―Rockhampton's was named The Queensland Institute of Technology, Capricornia (QITC)―were affiliated with the main Queensland Institute of Technology campus in Brisbane and lacked the autonomy of universities, being controlled by the Queensland Education Department. When the QITC first opened in February 1967, there was no extensive campus to greet the handful of staff and initial intake of 71 full-time and part-time students. While building progressed at Parkhurst, the first classes held on the top floor of the Technical College in Bolsover Street were a makeshift affair with no laboratories, library facilities or stock. By 1969, most staff and students had transferred to the Parkhurst campus, still a bushland site in progress―in the summer months, the campus was often ringed by spectacular bush fires or deluged with torrential rain: cars slid in the mud or were bogged and the QITC's foundation Principal, Dr Allan Skertchly, ferried people in his 4WD across floodwaters. Some students slept temporarily on mattresses in the canteen while waiting for the first residential college to open. After the passage of the amended Education Act in 1971, QITC became an autonomous, multi-functional college under the control of its own council and took the name of Capricornia Institute of Advanced Education (CIAE). Along with creating a traditional university campus experience in a natural setting, the CIAE also developed engineering and science projects. The CIAE became the first college in Australia to introduce a Bachelor of Science externally in 1974. By 1979, external enrolments at the CIAE had increased to 825 and by 1985 distance education had become a major campus operation, exceeding internal enrolments and offering 12 courses involving some 100 subjects and processing 23,980 study packages annually. Between 1978 and 1989, the CIAE established branch campuses in Central Queensland at Gladstone, Mackay, Bundaberg and Emerald. The CIAE became the University College of Central Queensland in 1990 and gained full university status in 1992. At that time it was known as the University of Central Queensland. The name was changed in 1994 to Central Queensland University. After the Australian government approved the enrolment of full-fee paying students in Australian institutions in 1986, the CIAE (and subsequently the university) began trans national education ventures with many countries, including Singapore, Hong Kong, Dubai and Fiji. Through a public-private partnership with CMS (which CQU fully acquired in 2011) the university opened its first international campus in Sydney in 1994, followed by international campuses in Melbourne in 1997, Brisbane in 1998 and the Gold Coast in 2001. In 2001, the university appointed Queensland's first female Vice-Chancellor, Professor Glenice Hancock, who retired in 2004. By 2006, the university was operating its four Australian International Campuses at Brisbane, Gold Coast, Sydney and Melbourne along with a campus in Suva, Fiji, while two other major offshore partnerships proceeded in Shanghai and Singapore, and diminishing operations in Hong Kong. In 2006, CQUniversity came under criticism by international students at the Melbourne campus describing themselves as "Cash cow" students after a majority of them failed a tax and accounting postgraduate subject. They complained of inadequate facilities and an inability to dispute their grading. The claims were disputed by the university who suggested that the subject was "tough". Former Victorian premier John Cain is quoted as saying that the Melbourne CQUniversity campus lacks the appropriate facilities expected in a tertiary institution, as it is run by a private company. The university restructured its international activities in the period 2006 to 2009 and rebranded its image in 2008, changing its brand from Central Queensland University to CQUniversity. In 2010, CQUniversity announced its intention to become Queensland's first "dual sector" university (and the first in Australia in more than a decade), offering a combination of higher education and vocational training, through a merger with the Central Queensland Institute of TAFE (CQIT). At the time, the project won support from then-Queensland Premier Anna Bligh. CQUniversity was criticised in 2011 by a group of doctors and scientists, including Australian Medical Association (AMA) President Steve Hambledon, for the university's decision to offer courses in chiropractic. In a letter to the university, the group writes, "Your chiropractic students may well be exposed to excellent courses in anatomy and some basic sciences. However the inclusion of subluxation theory as evidence-based reality is unacceptable." The university has since stated that its chiropractic program is fully accredited by Australia's peak chiropractic training body and that the group's criticisms were unfounded. Former Australian Medical Association president Dr Kerryn Phelps spoke out against the group's criticisms, saying alternative medicine courses should be celebrated rather than being taken out of universities, to encourage a more efficient dialogue between traditional and alternative practices. Monash University professor of medicine Paul Komesaroff also commented that the group had exceeded "the boundaries of reasonable debate" and were exploiting their positions in the community and engaging in censorship. In December 2011, the Federal Government announced that CQUniversity had been successful in gaining $73.8 million in funding to support its merger with CQIT and to strengthen the university's engineering courses. The university announced that it would fund a $16.6 million engineering precinct in Mackay, a $14 million public-access allied health clinic in Rockhampton, and a $12.5 million makeover of the Mackay TAFE campus through the funding allocation. In September 2012, Queensland Premier Campbell Newman announced the State's in-principle support for the CQUniversity-CQIT merger. The Newman government gave its final approval for the merger to proceed in December 2012. In July 2014, CQUniversity became Queensland's first dual sector university. In March 2018 the university announced it was in talks to establish a Medical school at its Rockhampton and Bundaberg campuses. Discussions are with the Hospital and Health Services of Central Queensland and Wide Bay, the main physical organisation of Queensland Health in the two regions. CQUniversity is governed by the CQUniversity Council, comprising the Chancellor, Vice-Chancellor and various elected and appointed representatives. Operationally, CQUniversity is managed by the Vice-Chancellor and five Deputy Vice-Chancellors who oversee portfolios including: International and Services, Industry and Vocational Education and Training, Student Experience and Governance, Engagement, Campuses and North Queensland Region, and Finance and Planning. CQUniversity Associate Vice-Chancellors manage 10 regions in which the University operates: Rockhampton, Wide Bay Burnett, Gladstone, Central Highlands, South East Queensland, North Queensland, Far North Queensland, Victoria, New South Wales and South Australia. Five Pro Vice-Chancellors coordinate the areas of learning and teaching, research, Indigenous engagement, International and TAFE. Schools are managed within a central faculty, the Higher Education Division, which is overseen by the Provost. CQUniversity is led by Scott Bowman who is the Vice-Chancellor and President of the University. Bowman was appointed to the position of Vice-Chancellor and President in 2009. The Vice-Chancellor is appointed by the University Council and reports to the Council through the Chancellor. The CQUniversity Council is the governing body of CQUniversity and was established under the Central Queensland University Act (1998). The International & Services Division, led by the Deputy Vice-Chancellor, (International & Services) is responsible for the activities which support the provision of academic and research activity across CQUniversity. Within the University Services portfolio lies the Directorates of Marketing, International, Information and Technology, Facilities Management, People and Culture, Library Services, Information Technology, and Commercial Services and the University Ombudsman. The Student Experience and Governance Division is led by the Deputy Vice-Chancellor (Student Experience & Governance) and is responsible for the management of governance processes within the university through the Council and sub-committees. The division is made up of three directorates including Governance, Student Residences and Student Experience and Communications. The Governance Directorate has day to day carriage of governance activities. The Internal Audit Directorate operates as an independent appraisal function which forms an integral part of the University's internal control framework. The Student Experience and Communications Directorate is responsible for promoting, supporting and enhancing the University's reputation, activities and achievements, through strategic communications. The Student Residences Directorate is responsible for the operation of student accommodation in Rockhampton and Mackay. CQUniversity has six schools, each of which are managed by specialist Deans. Two campuses operate in the Rockhampton region: Rockhampton, City (formerly CQ TAFE) and Rockhampton, North. The Rockhampton City campus is centrally located and offers a wide range of study options from certificates and diplomas to undergraduate programs. It also offers short courses in a range of areas including business, hospitality and beauty. Key facilities include Wilby's Training Restaurant, Hair Essence Hair Salon, Engineering Technology Centre, Trade training workshops and an Adult Learning Centre. The Rockhampton North campus is the university's headquarters. The campus has facilities including an Engineering Precinct, Health Clinic, Student Residence, food court and Sports Centre. The Engineering Precinct has labs for fluids, thermodynamics, thermofluids, geotech, concrete and structures, and electronics. There is also a new lecture theatre, a postgraduate area, a materials-testing area, an acoustic test cell, a soils store, and a multi-purpose project-based learning lab. The public-access health clinic on campus caters for up to 160 clients per day. The clinic allows students to work with qualified health professionals in the areas of oral health, occupational therapy, physiotherapy, podiatry and speech pathology. Two campuses operate in the Mackay region: CQUniversity Mackay, City (formerly CQ TAFE) and CQUniversity Mackay, Ooralea, including a Trades Training Centre. The Mackay City campus located on Sydney Street, in the Mackay CBD, delivers both vocational and academic courses. Facilities on the campus include 24-hour computer labs, training restaurants, hair dressing salon, beauty salon, canteen and library. The Mackay Ooralea campus is located on Mackay's southern outskirts and is about six kilometres from the city centre. The campus includes lecture theatres, a performance theatre, tutorial rooms, computer laboratories, a nursing laboratory, video-conference rooms, recording studios, student accommodation, a bookshop, a refectory and a library. On-site accommodation is provided at the Mackay Residential College. The Trade Training Centre caters for 1500 students doing apprenticeship programs in electrical, plumbing, carpentry, furnishing, metal fabrication, mechanical fitting and light and heavy automotive training, as well as skills training for the building, construction, mines, minerals and energy sectors. CQUniversity's Bundaberg campus is located on a 23-hectare site on Bundaberg's southern outskirts. The campus specialises in small class sizes and individually focused learning and teaching Campus facilities include a library, bookshop, campus refectory, a 200-seat and a 100‑seat lecture theatre, four computer laboratories, nursing clinical laboratories and videoconferencing rooms. In 2012, Bundaberg Regional Council and CQUniversity signed an accord as a formal expression of their commitment to have Bundaberg recognised as a 'University City'. The campus has an academic and research building which includes a 64-seat scientific laboratory, sound studio and multi-media and science research facilities. The campus also hosts a forensic crash lab to support learning for students enrolled in the Bachelor of Accident Forensics. From 2013, CQUniversity Bundaberg has also offer commercial pilot training through a partnership with the Australian Flight Academy. Two campuses operate in the Gladstone region: CQUniversity Gladstone, City (formerly CQ TAFE) and CQUniversity Gladstone, Marina. The Gladstone City campus is located in the CBD. It offers specialist training for the gas industry, instrumentation and business studies. Key facilities include a canteen, Engineering Technology Centre, computer labs, Adult Learning Centre, Hair Essence Hair Salon, beauty facilities and a sports oval. The Gladstone Marina campus is located within the Gladstone Marina precinct. It is home to the Gladstone Environmental Science Centre and the Gladstone Engineering Centre. Students at the campus use lecture theatre and training facilities, computer labs, the Cyril Golding Library, bookshop and a range of career counselling and support services. CQUniversity Noosa was first established in 2003 as a hub in the small Sunshine Coast village of Pomona, offering courses in Learning Management. In 2007, the Campus relocated to Goodchap Street, Noosaville and its capacity was doubled to accommodate 1200 students. The Noosa campus offers modern facilities and surrounds including clinical nursing laboratories, library and student resource centre facilities, state of the art collaborative learning spaces and is home to the Learning and Teaching Education Research Centre (LTERC). CQUniversity Emerald (formerly CQ TAFE) is located on the Capricorn Highway, 275 km west of Rockhampton, and delivers trade based apprenticeships. Campus facilities include workshops for apprenticeship training, student common room and an afterhours computer lab. CQUniversity Brisbane is located in the heart of the CBD at 160 Ann Street, Brisbane. The campus comprises nine floors of facilities including lecture rooms, multimedia labs, bookshop, library and a student lounge. CQUniversity Sydney is located on 400 Kent Street. With over 2000 international students, Sydney campus has the largest student population. The campus comprises lecture theatres, multimedia labs, bookshop, library, café and a student lounge. In 2013 the basement of the campus building was renovated and is now used as a dedicated space for students to relax and socialise. CQUniversity Melbourne is a city campus. the Campus comprises multimedia labs, CQUni Bookshop, library, student lounge, and presentation and audio-visual equipment. CQUniversity Adelaide is located in the south-west of the city within close proximity to the Adelaide Showgrounds. The Campus is home to The Appleton Institute, a multidisciplinary research hub formerly Adelaide's Centre for Sleep Research. The Institute specialises in research, teaching and community engagement in a wide range of areas including safety science, sleep and fatigue, human factors and safety management, applied psychology, human-animal interaction and cultural anthropology. A Cairns study centre was established in July 2012 to cater to around 350 CQUniversity distance education students in the Far North Queensland region. The centre allows students to form study groups, access e-library and internet resources, sit exams, lodge assignments, participate in live lectures broadcast via high-speed internet, and make academic enquiries. CQUniversity also operates distance education centres, hubs and sites in Charters Towers, Cooma, Cannonvale, Townsville, Perth, Karratha, Edithvale, and Geraldton. The University is also a partner in the Queensland Centre for Social Science Innovation (QCSSI) together with the Queensland State Government, University of Queensland (UQ), Griffith University (GU), Queensland University of Technology (QUT) and James Cook University (JCU). The QCSSI is based at the St Lucia campus of UQ. CQUniversity's stated aim is to be Australia's most engaged university. To this end, the university has appointed a Pro Vice-Chancellor (Community & Engagement) and encourages staff to record their engagement experiences in a comprehensive engagement database known as E-DNA. The University also runs an award ceremony known as the Opal Awards, which recognise staff for excellence in engagement. In March 2012, CQUniversity appointed former Queensland University of Technology and Monash University academic Bronwyn Fredericks to the role of Pro Vice-Chancellor (Indigenous Engagement). Professor Fredericks, a Murri woman, is also the inaugural BMA Chair in Indigenous Engagement, a position funded by coal mining group BMA. Her stated aim is to pursue engagement with the Central Queensland region's numerous Indigenous communities to improve education outcomes. CQUniversity is a partner of Indian charity Salaam Baalak Trust, which rescues, cares for and educates street children. The university provides higher education scholarships to Salaam Baalak children and sponsors the charity's City Walk program. As part of its commitment to engagement, CQUniversity implemented Ucroo's Digital Campus platform became a member of the Talloires Network. The University began collecting art in the 1970s and has since developed a collection of almost 600 art works, including international and Australian paintings, ceramics, prints and photographs. While there is not a gallery or museum space at the university, art works are displayed across the campus network and lent to other organisations, such as regional galleries and other universities, for display in temporary exhibitions. CQUniversity graduates were ahead of the national rate for graduate full-time employment according to figures compiled by Graduate Careers Australia (GCA). GCA published a full-time report of 71.3%, while a direct comparison had the CQUniversity graduate full-time employment rate at 81.1%. In 2013 CQUniversity was awarded five stars for online delivery, internationalisation and access in its first foray into the global university ratings QS Stars. It also scored a 4 for teaching and for facilities. In 2012, CQUniversity lifted its rankings in the Excellence in Research for Australia (ERA) audit from 28 (in 2010) to 21. The University picked up three five-star ratings in 2012, up from its 2010 result of just two three-star ratings. CQUniversity performed at or well above world standard in four areas of research according to ERA 2012, with nursing research continuing to perform at 'world standard', and research in applied mathematics, agriculture and land management, and other medical and health sciences deemed to be ranked at the highest levels of performance 'well above world standard'. As of 2014, CQUniversity had around 35,000 students enrolled across its various campuses as well as by distance education. International students can study at CQUniversity campuses located at Brisbane, Adelaide, Melbourne and Sydney, or at CQUniversity's regional campuses in Bundaberg, Gladstone, Noosa, Mackay or Rockhampton. Craig Zonca, breakfast presenter at ABC Radio Brisbane. ^ History Archived 2 October 2012 at the Wayback Machine, CQUniversity website. Retrieved on 13 September 2012. ^ (7 March 2016) Power station manager takes on CQUni's top role, The Observer, News Corp Australia. Retrieved 30 August 2018. ^ Vice-Chancellor and President Archived 11 September 2013 at the Wayback Machine, CQUniversity website. Retrieved on 13 September 2012. ^ "Locations". Archived from the original on 13 March 2018. Retrieved 17 July 2015. ^ Cryle, Dennis. Academic Capricornia: A History of the University of Central Queensland. 1992, pp. 8–9. ^ Cryle 1992, p. 1. ^ Cryle 1992, p. 2. ^ "Chancellor retires" (transcript) Archived 19 June 2013 at the Wayback Machine. ABC Stateline, 5 March 2004. Retrieved on 18 December 2012. ^ “State Parliament. Mr Gardner on Educational Needs”, The Central Queensland Herald (Rockhampton), 15 November 1956. Retrieved on 21 November 2012. ^ Cryle 1992, pp. 2–3. ^ Cryle 1992, p. 5. ^ Cryle 1992, p. 8. ^ Cryle 1992, pp. 8–10. ^ a b Cryle 1992, pp. 11–12. ^ Cryle 1992, pp. 14–15. ^ Cryle 1992, p. 15. ^ Cryle 1992, pp. 8–9. ^ Cryle 1992, pp. 59–60. ^ Cryle 1992, p. 44. ^ Cryle 1992, p. 70. ^ Cryle 1992, pp. 83–87. ^ “Home and Away, Kathy’s been at the cusp of Uni growth” Archived 15 January 2013 at Archive.today. CQUniversity website, 22 November 2012. Retrieved 22 November 2012. ^ “Staff farewell CQU Vice-Chancellor” Archived 7 October 2009 at the Wayback Machine. CQUniversity website, 16 July 2004. Retrieved 22 November 2012. ^ "'Cash cow' students take stand against uni". Archived from the original on 9 April 2016. Retrieved 17 July 2015. ^ Australian Universities Quality Agency website Archived 16 June 2013 at the Wayback Machine. Retrieved on 18 December 2012. ^ "Government backs university, TAFE merger". ABC News. Archived from the original on 4 December 2014. ^ "University challenged for giving undeserved credibility to alternative therapies". Australasian Science. Archived from the original on 25 January 2012. Retrieved 18 December 2011. ^ "CQU asked to rethink degree plan". Daily Mercury. Archived from the original on 14 June 2012. Retrieved 12 September 2012. ^ "Australian Doctors, Scientists Wage War on Alternative Medicine". The Atlantic. Archived from the original on 4 September 2012. Retrieved 12 September 2012. ^ "Push to rid universities of alternative medicine". The Age. Archived from the original on 23 September 2012. Retrieved 12 September 2012. ^ "CQUni gears up for $74m merger", Queensland Times, 12 December 2011. Retrieved on 14 September 2012. ^ Ross, John. "Qld backs CQU merger" Archived 13 September 2012 at the Wayback Machine, The Australian, 12 September 2012. Retrieved on 14 September 2012. ^ "Government approves CQU and CQIT merger" Archived 21 December 2014 at the Wayback Machine, My Sunshine Coast, 7 December 2012. Retrieved on 17 December 2012. ^ "Qld's first comprehensive uni as merge occurs". The Mackay Mercury. Archived from the original on 10 November 2014. Retrieved 9 November 2014. ^ "CQUni in talks with regional health boards to establish a medical school". Central Queensland University. 9 March 2018. Retrieved 26 August 2018. ^ Pearce, Frazer (9 March 2018). "Ambitious Rocky medical school plan revealed". Rockhampton. Retrieved 26 August 2018. ^ "CQUniversity Council". Archived from the original on 29 September 2011. Retrieved 17 July 2015. ^ "University Executives". CQUniversity. Archived from the original on 4 March 2014. Retrieved 10 November 2014. ^ "New CQ University Vice-Chancellor to spread his wings over regional Queensland" Archived 21 June 2013 at the Wayback Machine, ABC Capricornia, 29 May 2009. Retrieved on 17 December 2012. ^ "vice-chancellor-and-president-of-cquniversity". CQUniversity. Archived from the original on 11 September 2013. Retrieved 10 November 2014. ^ CQUniversity University Executives webpage Archived 4 March 2014 at the Wayback Machine. Retrieved on 17 December 2012. ^ CQUniversity Council webpage Archived 12 October 2012 at the Wayback Machine. Retrieved on 17 December 2012. ^ "Deputy Vice-Chancellor University Services". CQUniversity. Archived from the original on 10 November 2014. Retrieved 10 November 2014. ^ "Deputy Vie-Chancellor Industry, Vocational Training and Access Education". CQUniversity. Archived from the original on 10 November 2014. Retrieved 10 November 2014. ^ "STEPS". CQUniversity. Archived from the original on 10 November 2014. Retrieved 10 November 2014. ^ "Train". CQUniversity. Archived from the original on 10 November 2014. Retrieved 10 November 2014. ^ "Deputy Vice-Chancellor (Student Experience & Governance)". CQUniversity. Archived from the original on 10 November 2014. Retrieved 10 November 2014. ^ CQUniversity Corporate Governance Directorate webpage Archived 10 December 2012 at the Wayback Machine. Retrieved on 17 December 2012. ^ CQUniversity Audit & Advisory Directorate webpage Archived 10 December 2012 at the Wayback Machine. Retrieved on 17 December 2012. ^ CQUniversity Director Corporate Communications webpage Archived 23 February 2013 at the Wayback Machine. Retrieved on 17 December 2012. ^ "Student Residences". CQUniversity. Archived from the original on 10 November 2014. Retrieved 10 November 2014. ^ "School of Education and the Arts". CQUniversity. Archived from the original on 7 November 2014. Retrieved 10 November 2014. ^ "School of Business and Law". CQUniversity. Archived from the original on 7 November 2014. Retrieved 10 November 2014. ^ "School of Engineering and Technology". CQUniversity. Archived from the original on 7 November 2014. Retrieved 10 November 2014. ^ "School of Medical and Applied Sciences". CQUniveristy. Archived from the original on 7 November 2014. Retrieved 10 November 2014. ^ "School of Human Health and Social Sciences". CQUniversity. Archived from the original on 12 January 2015. Retrieved 10 November 2014. ^ "School of Nursing and Midwifery". CQUniversity. Archived from the original on 21 November 2014. Retrieved 10 November 2014. ^ "Study". CQUniversity. Archived from the original on 24 December 2014. Retrieved 10 November 2014. ^ "CQUniversity Townsville campus continues to grow". CQUniversity. 31 July 2017. Archived from the original on 4 April 2018. Retrieved 4 April 2018. ^ "Rockhampton". CQUniversity. Archived from the original on 24 December 2014. Retrieved 10 November 2014. ^ "Multi-million dollar precinct adds to Engineering prestige" Archived 5 April 2013 at Archive.today, CQUniversity website, 12 July 2012. Retrieved on 30 November 2012. ^ "$6m clinic to boost health studies", The Morning Bulletin website, 25 August 2011. Retrieved on 30 November 2012. ^ CQUniversity Mackay webpage Archived 11 October 2012 at the Wayback Machine. Retrieved on 12 September 2012. ^ CQUniversity Mackay campus facilities webpage Archived 12 October 2012 at the Wayback Machine. Retrieved on 12 September 2012. ^ "Business as usual at Trade Training Centre in Mackay". The Daily Mercury. Archived from the original on 10 November 2014. Retrieved 10 November 2014. ^ CQUniversity Bundaberg webpage Archived 11 October 2012 at the Wayback Machine. Retrieved on 12 September 2012. ^ CQUniversity Bundaberg campus facilities webpage Archived 12 October 2012 at the Wayback Machine. Retrieved on 12 September 2012. ^ "Bundaberg to be known as university city" Archived 10 November 2014 at the Wayback Machine, Bundaberg Regional Council, 1 March 2012. Retrieved on 12 September 2012. ^ CQUniversity About Bundaberg Campus webpage Archived 12 October 2012 at the Wayback Machine. Retrieved on 17 December 2012. ^ "CQU leads the way in forensic crash investigation" Archived 15 January 2013 at Archive.today, 4BU, 26 November 2012. Retrieved on 17 December 2012. ^ "CQUniversity sets up CPL training in Bundaberg" Archived 15 December 2014 at the Wayback Machine, Australian Flying, 7 September 2012. Retrieved on 17 December 2012. ^ "Gladstone". CQUniversity. Archived from the original on 21 November 2014. Retrieved 10 November 2014. ^ CQUniversity Noosa webpage Archived 19 September 2012 at the Wayback Machine. Retrieved on 17 December 2012. ^ "CQUniversity Noosa". CQUniversity. Archived from the original on 30 November 2014. Retrieved 10 November 2014. ^ "LTERC". CQUniversity. Archived from the original on 10 November 2014. Retrieved 10 November 2014. ^ a b "Brisbane". cqu.edu.au. CQUniversity. Archived from the original on 19 March 2018. Retrieved 6 May 2018. ^ "CQU cements its presence in Cairns" Archived 10 November 2014 at the Wayback Machine, The Scan, 23 April 2012. Retrieved on 12 September 2012. ^ "CQUni makes Townsville a 'Two Uni City' and Charters Towers a tertiary hub". CQUniversity. Archived from the original on 10 November 2014. Retrieved 10 November 2014. ^ "Uni partners with Cannonvale TAFE". Whitsunday Times. Archived from the original on 10 November 2014. Retrieved 10 November 2014. ^ "Universities in turf war as CQU confirms Townsville CBD base". Townville Bulletin. Archived from the original on 10 November 2014. Retrieved 10 November 2014. ^ "Perth and Karratha now part of Australia's largest network of university delivery sites". Expert Guide. Archived from the original on 10 November 2014. Retrieved 10 November 2014. ^ "Welcome". Geraldton Universities Centre. Archived from the original on 14 February 2014. ^ "Research Organisations". CQUniversity. Archived from the original on 21 December 2013. Retrieved 10 November 2014. ^ "UQ to host unique research centre to benefit Queenslanders". UQ News. Archived from the original on 17 June 2013. Retrieved 17 July 2015. ^ The Office of Community & Engagement Archived 19 September 2012 at the Wayback Machine, CQUniversity website. Retrieved on 13 September 2012. ^ Pro Vice-Chancellor (Community and Engagement) and Head of Campus Mackay Archived 12 October 2012 at the Wayback Machine, CQUniversity website. Retrieved on 13 September 2012. ^ "Board members converge in Mackay for engaging discussions" Archived 27 November 2012 at Archive.today, CQUniNews, 17 May 2012. Retrieved on 13 September 2012. ^ Engagement Awards Archived 11 October 2012 at the Wayback Machine, CQUniversity website. Retrieved in September 2012. ^ Frogley, Adam. "Announcement – Pro Vice Chancellor Indigenous Engagement CQU" Archived 28 November 2012 at Archive.today, NTEU website, 20 April 2012. Retrieved on 14 September 2012. ^ "Coal cash for CQUniversity" Archived 5 March 2014 at the Wayback Machine, Indigenous Scholarships website. Retrieved on 14 September 2012. ^ Acknowledgement Archived 9 October 2012 at the Wayback Machine, Salaam Baalak Trust website. Retrieved on 13 September 2012. ^ CQUniversity (Australia) – The Talloires Network Archived 20 September 2012 at the Wayback Machine, Talloires Network website. Retrieved on 13 September 2012. ^ "All unis winners in research audit". The Australian. 4 December 2015. Archived from the original on 4 August 2017. Retrieved 21 February 2017. ^ "CQUniversity Australia". Graduate Careers Australia. Archived from the original on 10 November 2014. Retrieved 10 November 2014. ^ "CQUni awarded 5 stars for internationalisation, access and online delivery". CQUniNews. Archived from the original on 10 November 2014. Retrieved 10 November 2014. ^ "Ranking research quality: ERA 2012" Archived 17 December 2012 at the Wayback Machine, The Australian. Retrieved on 17 December 2012. ^ "Academic recruit lifts audit rating" Archived 16 December 2012 at the Wayback Machine, The Australian, 12 December 2012. Retrieved on 17 December 2012. ^ "Investment in research starting to pay off for CQUniversity" Archived 4 February 2013 at the Wayback Machine, CQUniversity website, 6 December 2012. Retrieved on 17 December 2012. ^ "International Students". CQUniversity. Archived from the original on 1 December 2014. Retrieved 10 November 2014. ^ Pearce, Frazer. "Assange studied at CQU" Archived 20 December 2010 at the Wayback Machine, The Morning Bulletin, 18 December 2010. Retrieved on 13 September 2012. ^ "The Sapphires' director Wayne Blair tells students Rockhampton upbringing no disadvantage". ABC News. 3 November 2015. Archived from the original on 26 November 2015. Retrieved 9 December 2015. ^ Owens, Jared. "Immigration secretary Martin Bowles to head health department". The Australian. Retrieved 10 November 2014. ^ "CQU graduate new CEO for Energex" Archived 4 October 2009 at the Wayback Machine, CQUniversity website, 26 February 2007. Retrieved on 10 December 2012. ^ "Horneman-Wren sworn in as District Court judge" Archived 2 November 2012 at the Wayback Machine, Queensland Government statements website. Retrieved on 10 December 2012. ^ Our graduates – archive Archived 11 October 2012 at the Wayback Machine, CQUniversity website. Retrieved on 13 September 2012. ^ "Singer takes final bos" Archived 3 March 2016 at the Wayback Machine, The Daily Mercury website, 19 April 2012. Retrieved on 10 December 2012. ^ "Our Alumni". CQUniversity. Archived from the original on 10 November 2014. Retrieved 10 November 2014. ^ "Professor David Battersby". Federal University. Archived from the original on 31 May 2014. Retrieved 10 November 2014. ^ As a rising radio talent, this CQUni Alumnus will be 'up with the sparrows' Archived 18 February 2017 at the Wayback Machine, CQUniNews, 15 December 2016. Retrieved 17 February 2017. 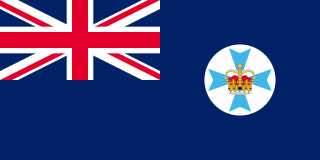 Queensland is the second-largest and third-most populous state in the Commonwealth of Australia. Situated in the north-east of the country, it is bordered by the Northern Territory, South Australia and New South Wales to the west, south-west and south respectively. To the east, Queensland is bordered by the Coral Sea and Pacific Ocean. To its north is the Torres Strait, with Papua New Guinea located less than 200 km across it from the mainland. The state is the world's sixth-largest sub-national entity, with an area of 1,852,642 square kilometres (715,309 sq mi). Rockhampton is a city in the Rockhampton Shire of Queensland’s Central Coast Queensland, Australia. The estimated urban population of Rockhampton in June 2015 was 80,665, making it the fourth-largest city in the state outside of the cities of South East Queensland. and the 22nd-largest city in Australia. Gladstone is a city in the Gladstone Region, Queensland, Australia. It is approximately 550 km (340 mi) by road north of Brisbane and 100 km (62 mi) south-east of Rockhampton. Situated between the Calliope and Boyne Rivers, Gladstone is home to Queensland's largest multi-commodity shipping port. Mackay is a city and its centre suburb in the Mackay Region on the eastern coast of Queensland, Australia. It is located about 970 kilometres (603 mi) north of Brisbane, on the Pioneer River. Mackay is nicknamed the sugar capital of Australia because its region produces more than a third of Australia's sugar. Central Queensland is an ambiguous geographical division of Queensland that centres on the eastern coast, around the Tropic of Capricorn. Its major regional centre is Rockhampton. The region extends from the Capricorn Coast west to the Central Highlands at Emerald, north to the Mackay Regional Council southern boundary, and south to Gladstone. The region is also known as Capricornia. It is one of Australia's main coal exporting regions. Bond University is Australia's first private not-for-profit university and is located in Robina, Gold Coast, Queensland. Since its opening on 15 May 1989, Bond University has primarily been a teaching-focused higher education institution featuring a three-semester-per-year timetable, which allows students to complete an undergraduate degree in two years. Agnes Water is a town and a locality in the Gladstone Region, Queensland, Australia. In the 2016 census, Agnes Water had a population of 2,210 people. Mount Larcom is the name of a mountain, a township and a locality in the Gladstone Region, Queensland, Australia. The township/locality is at the junction of the Bruce Highway and Port Curtis Way approximately 70 kilometres (43 mi) south of the city of Rockhampton. At the 2011 census, Mount Larcom had a population of 278. The North Coast railway line is a narrow gauge railway line in Queensland, Australia. 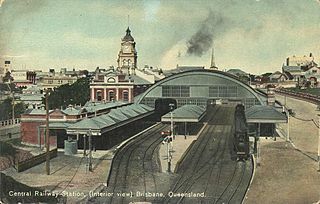 It commences at Roma Street station, Brisbane, and largely parallels the Queensland coast to Cairns in Far North Queensland. The line is electrified between Brisbane and Rockhampton. Along the way, the 1680 km railway passes through the numerous towns and cities of eastern Queensland including Nambour, Bundaberg, Gladstone, Rockhampton, Mackay and Townsville. The line though the centre of Rockhampton runs down the middle of Denison Street. Rosedale is a rural town and locality split between the Gladstone Region and the Bundaberg Region in central Queensland, Australia. At the 2011 census, Rosedale and the surrounding area had a population of 448. Parkhurst is a suburb of Rockhampton in the Rockhampton Region, Queensland, Australia. At the 2011 Australian Census the suburb recorded a population of 1,385. Toolooa is a suburb of Gladstone in the Gladstone Region, Queensland, Australia. In the 2011 census, Toolooa had a population of 1,164 people. Gladstone Central is a suburb of Gladstone in the Gladstone Region, Queensland, Australia. It is the historic centre and central business district of the city of Gladstone and the seat of the Gladstone Regional Council. In the 2011 census, Gladstone Central had a population of 1,529 people. The Central Queensland NRL bid was launched in March 2009 in an attempt to represent Central Queensland in an expanded National Rugby League competition. The bid is headquartered in Rockhampton, Queensland. The bid team is hoping to secure Gorden Tallis as their coach.